A new champion has been crowned at the 2017 World Series of Poker and it's Chris Bolek, who emerged victorious after defeating Bryan Emory heads-up to claim his first gold bracelet and $266,646 in Event #50: $1,500 No-Limit Hold'em BOUNTY. The tournament saw a field of 1,927 entries, which created a prize pool of $2,601,450, and each elimination added $500 to the pocket of the winner. The final table included such big names as 2014 November Niner Dan Sindelar, Argentina's Richard Dubini, and Dutch poker stalwart Govert Metaal. An unscheduled fourth day was added after 121 hands of the official final table last night saw five players bag up and return to the Rio All-Suite Hotel and Casino at 1 p.m. local time on June 29th 2017. Bolek previously won a WSOP Circuit ring at the Palm Beach Kennel Club in 2014, and he had already cashed four times at the 2017 WSOP, with a total of $404,388 in WSOP and Circuit cashes prior to his victory. He came into the final day as one of the three short stacks with just 14 big blinds and ran extremely well to emerge victorious, picking up seven bounties and his own for $500 apiece. When asked how Bolek felt to win his first bracelet, he responded, "It feels very surreal. I came in pretty short to the final table, and I just wanted to give myself a shot to win. People say how good it is to visualize things, so I spent some time trying to do that this morning to get into the right mindset, and it just kind of all came together perfectly." Bolek was then asked what the run was like from four-handed onward, where he seemed to just steam roll things. "That was just a rush of cards, man," he said. "From the double-up with queen-ten versus ace-jack where I rivered a jack; that just felt unbelievable. It felt like, if I win that hand, I was just going to play well and not lose. Then I really just hit a rush of cards. I had a really good hand in every spot that I played a big pot with. The all ins worked every time, which doesn't really happen, but that was really nice for it to happen now." While Bolek likes to travel, most of his big scores so far have come back home in Florida, and he took previously missed chances as a learning opportunity. Runner-up Bryan Emory came into the day as the chip leader and kept his 11 bounty chips next to his stack the entire time. After pulling away early on, Emory seemed poised to claim the title and was still all smiles before entering heads-up with a crushing chip deficit. Zhaoxing Wang moved all in on the very first hand, and he did so again in the fourth hand of the final day. This time, he was called by initial raiser James Gilbert, and Wang tabled ace-nine suited. Gilbert had the dominating ace-ten suited and filled up to a full house, tens over aces, by the river. Soon after, Chris Bolek came from behind to double through James Gilbert when his queen-ten met ace-jack suited of Gilbert. An ace-king-king flop left Bolek with a gutshot, and the river brought a jack to complete the straight. 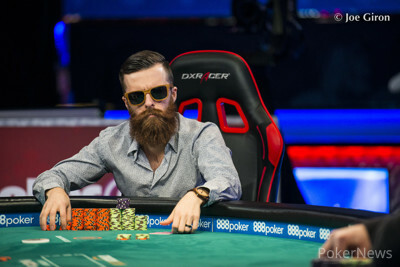 In Hand #147 of the official final table, Chris Bolek moved all in from the small blind, and Tobias Peters called in the big blind for slightly less. Bolek tabled pocket jacks, and Peters had ace-ten. A jack on the flop and a jack on the turn gave Bolek quads, and Peters had to settle for fourth place. Only five hands later, Bolek scored another vital double through Bryan Emory when the latter defended his big blind with king-eight. Bolek flopped an open-ended straight draw with jack-ten suited, and a king on the river gave Emory top pair while Bolek improved to the nut straight. Bolek's shove was reluctantly called, and that vaulted him into the top spot. Soon after, Emory also paid off the trips tens of Bolek when holding pocket sevens, and that created a commanding lead. On Hand #162, James Gilbert moved all in for his last 11 big blinds from the button, and Chris Bolek called in the big blind with pocket queens. Gilbert only had queen-jack and was drawing dead on the turn of a king-high board to give Bolek a 6:1 lead for heads-up. It took ten hands from there to determine a champion. Bryan Emory moved all in for most of the hands to build his stack slightly, but his three-bet shove in Hand #172 was quickly called by Chris Bolek with red eights. Emory's ace-four suited failed to connect with the board, and Emory had to settle for second place and a payday of $164,735. This marks the end of the PokerNews' live reporting of Event #50, and the halfway mark has already been reached with all eyes set on the upcoming $50,000 Poker Players Championship and the Main Event. 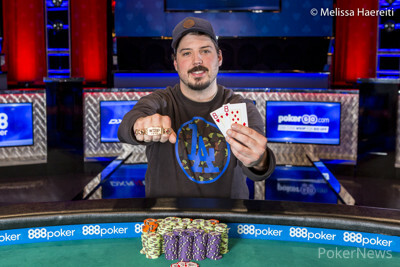 Chris Bolek wins a Gold WSOP Bracelet in Event #50, $1,500 No-Limit Hold'em Bounty event. Hand #172: Chris Bolek was on the button and raised to 450,000. Bryan Emory was on the button and moved all in for roughly 3,000,000, and Bolek called. The flop was , which was no help to Emory. The turn was the , and Emory was drawing to an ace if he was going to stay alive. The river was turned over, and it was the , clinching the championship for Bolek and making Emory the runner-up for the event. Hand #168: Chris Bolek raised to 350,000, and Bryan Emory moved all in to claim the pot without showdown. Hand #169: Emory moved all in from the small blind, and Bolek folded. Hand #170: Bolek raised to 350,000, and Emory shoved for the third hand in a row to chip up further. Hand #171: Emory limped in, and Bolek raised to 550,000. That ended the hand right there, as Emory sent his cards into the muck. 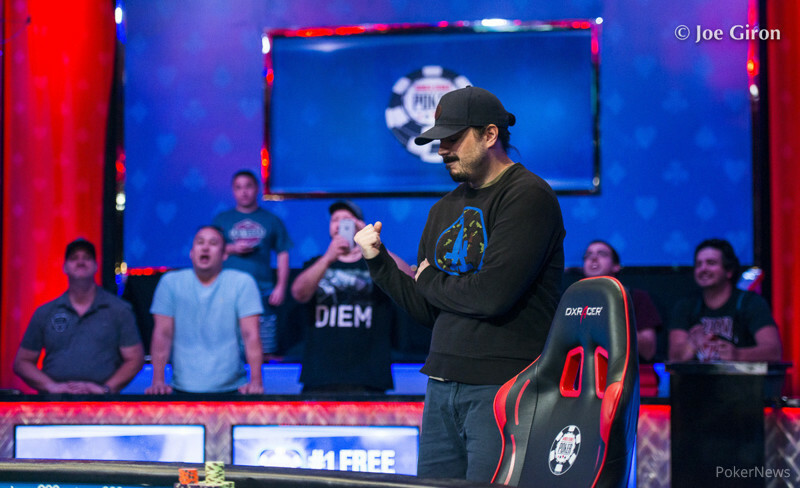 Hand #163: Bryan Emory limped on the button, and Chris Bolek checked his option. The flop was , and both players checked to the turn, which was the . Bolek check-called Emory's bet of 160,000. The river was the , and Bolek check-folded to Emory's bet of 300,000. Hand #164: Chris Bolek moved all in on the button, and Bryan Emory folded his big blind. Hand #165: Bryan Emory moved all in on the button, and Chris Bolek folded his big blind. Hand #166: Chris Bolek raised to 350,000 on the button. Bryan Emory moved all in from the big blind, and Bolek folded. Hand #167: Bryan Emory called on the button, and Chris Bolek checked his option. The flop was , and Bolek check-called a bet of 225,000. The turn was the , and Bolek check-called a bet of 475,000. The river was the , and both players checked. Emory showed , and Bolek tabled for a chopped pot, with both men playing two pair and a queen kicker. 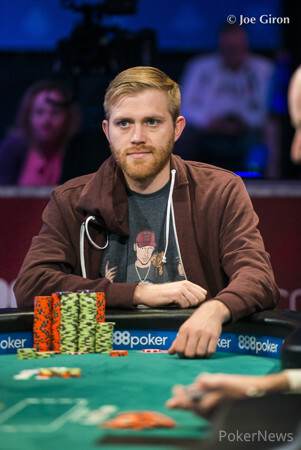 Hand #162: James Gilbert was on the button and raised all in for roughly 1,800,000. Chris Bolek was in the big blind and called. The board ran out and Gilbert will have to settle for third place and a great six-figure score. Hand #158: Chris Bolek raised to 350,000 on the button and won the blinds and antes. Hand #159: Bolek received a walk in the big blind. Hand #160: James Gilbert received a walk in the big blind. Hand #161: Bolek opened the action with a raise to 350,000 on the button. Bryan Emory called in the big blind and bet the flop for 225,000. Bolek called and the appeared on the turn. Emory checked and Bolek bet 475,000. Emory reached into his stack and called, then the on the river paired the board. Emory checked and Bolek bet 1,200,000. Emory called and Bolek flipped over for trip tens, while Emory sighed and mucked his cards after showing them very briefly, saying "I can't get away from it" as he did. Hand #153: James Gilbert was on the button and raised to 350,000. Chris Bolek was in the big blind and moved all in, Gilbert folded. Hand #154: Chris Bolek moved all in from the small blind and won the big blind. Hand #155: Chris Bolek was on the button and called. Bryan Emory was in the big blind and checked. Both players checked to the river and the board read . Emory led out for 250,000 and Bolek folded. 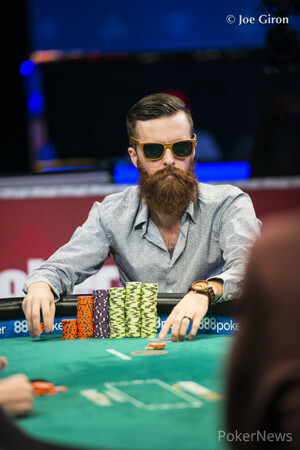 Hand #156: Bryan Emory was in the small blind and raised to 380,000. Chris Bolek was in the big blind and three-bet to 975,000, Emory folded. Hand #157: Bryan Emory was on the button and raised to 380,000, the blinds folded.